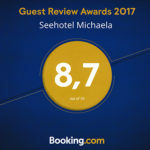 The 4 star Seahotel Michaela is only 11 driving minutes (about 8.5 km) from the A5 Motorway – Frankfurt / Main – Kassel, so it’s right in the center of Hesse! Coming from Frankfurt you can reach us by car directly from the exit Alsfeld-West.Turn right on the B 49, direction Alsfeld.After approx. 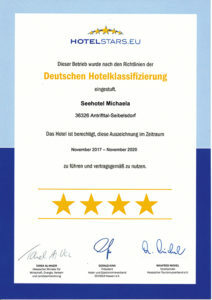 2.5 km, turn left onto the B62 in the direction of Marburg / Kirchhain.Follow the B 62 to Angenrod. At the village exit turn right (L3070), direction Seibelsdorf.After about 1.5 km, the Seahotel Michaela is on the right side. Coming from Kassel you can reach us by car directly from the exit Alsfeld-Ost.Then left on the B 62, direction Alsfeld.Follow the B 62 in the direction of Marburg / Kirchhain to Angenrod.At the village exit turn right (L3070), direction Seibelsdorf.After about 1.5 km, the Seahotel Michaela is on the right side. Further details can also be found in the map below and / or you can use the free route planner of the Google search engine here.We wish you a safe and pleasant journey and are looking forward to your visit!